If anyone was going to dupe the most famous contour product in the beauty world, it was going to be Makeup Revolution. Famed for their impeccable replicas of products from high-end brands such as Urban Decay and Lorac, Makeup Revolution have fast become the darlings of the drugstore. 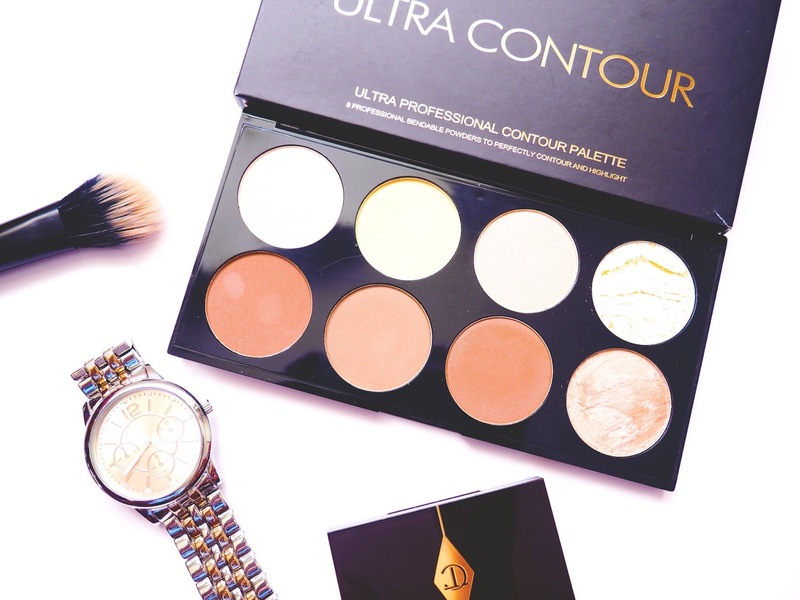 The Ultra Contour Palette (£8) is a product that I have had my eye on since it launched back in July. As soon as I spied it in my local Superdrug, I made sure I snapped it up and got my contour on! The palette contains 8 shades (as opposed to 6 in the Anastasia Pro Series Contour Kit). with a mix of highlight, setting and contouring powders. The top row houses all things highlight. There are two matte shades, one with a pinky tone and another in a more banana toned shade. On the right are two shimmery highlighters, the first being warm in tone with a peachy glow, similar to theBalm's Cindy Lou-manizer. 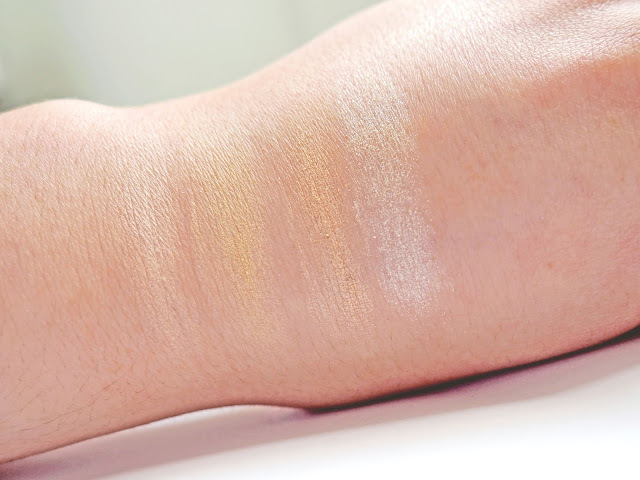 The end shade is a glittery icy white baked highlight, with a swirl of gold. On the bottom row, we have the contour shades. The first three are all matte, with two warm shades more suited to bronzing, and one with more of a cool grey tone for contouring. The final shade in the palette isn't actually a contour shade, rather a beautiful golden radiance powder. 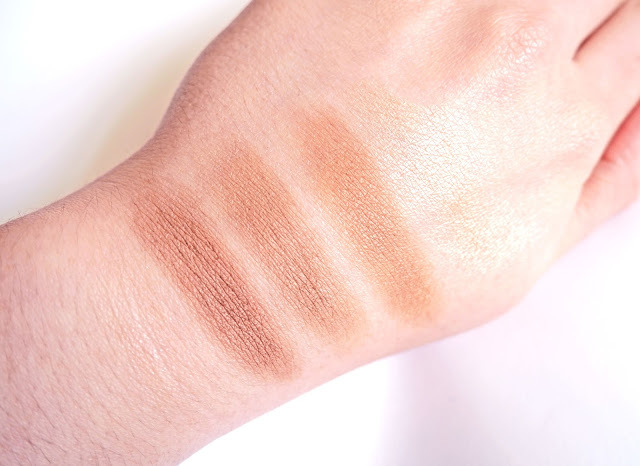 I have swatched the shades below. It did take quite a heavy swatch to get the highlighters to show up, especially with the first two mattes. On my pale skin, the two matte highlighters just aren't light enough for said purpose, but they do work nicely as setting powders. I use the banana shade under the eyes to brighten, and the pinkier shade on the rest of the face. This is awesome as it makes the palette great for travel. You won't need to pack a separate powder compact. I have to say that I'm not the hugest fan of the icy highlight. It is a duplicate from the Sugar & Spice Palette, and I wasn't a fan of it in that one either. I find it too stark and the glitter sits on top of the skin rather than being a soft, buttery shimmer like the peachy shade it. It is slightly more buttery than in the blush palette, but the quality is under par compared to the rest of the palette. The main shade that I use for contouring is the second, cooler toned shade on this bottom row. I buff it in the hollows of my cheekbones (what cheekbones?) using a RealTechniques Duo Fibre Contour Brush, and blend blend blend. To add more depth, sometimes I go back in and add a touch of the same powder with a smaller fluffy brush, like the MAC 217. The warm matte shades on the bottom row are too warm for contouring my skin, but I do like to use them as bronzers. I swirl my brush between the golden radiance powder and the adjacent matte shade and sweep over the high points of my face. The aforementioned radiance powder has featured in previous palettes, and is perhaps one of my favourite things from Makeup Revolution. It is subtle enough to use all over to give a beautiful lit from within look, without looking like a glitterball. 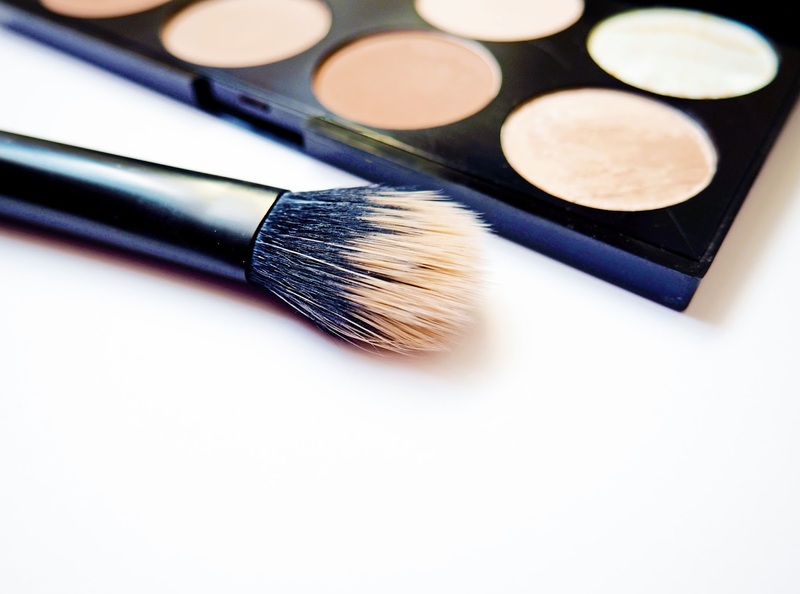 Do you prefer contouring or strobing? Don't forget to check out Damzel In This Dress, my October Blogger of the Month!